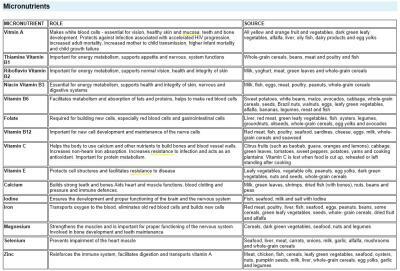 Micronutrients | Infonet Biovision Home. Vitamin C Helps the body to use calcium and other nutrients to build bones and blood vessel walls. Increases non-heam iron absorption. Increases resistance to infection and acts as an antioxidant. Important for protein metabolism. Citrus fruits (such as baobab, guava, oranges and lemons), cabbage, green leaves, tomatoes, sweet peppers, potatoes, yams and cooking plantains. Vitamin C is lost when food is cut up, reheated or left standing after cooking. Calcium Builds strong teeth and bones Aids heart and muscle functions, blood clotting and pressure and immune defenses. Milk, green leaves, shrimps, dried fish (with bones), nuts, beans and peas. Iodine Ensures the development and proper functioning of the brain and the nervous system Fish, seafood, milk and salt with iodine. Iron Transports oxygen to the blood, eliminates old red blood cells and builds new cells Red meat, poultry, liver, fish, seafood, eggs, peanuts, beans, some cereals, green leafy vegetables, seeds, whole- grain cereals, dried fruit and alfalfa. Zinc Reinforces the immune system, facilitates digestion and transports vitamin A Meat, chicken, fish, cereals, leafy green vegetables, seafood, oysters, nuts, pumpkin seeds, milk, liver, whole-grain cereals, egg yolks, garlic and legumes. Lee V, Ahmed F, Wada S, et al. Extent of vitamin A deficiency among rural pregnant women in Bangladesh. PUBLIC HEALTH NUTR. Jun 12 2008;1-6.